Educated at St. David’s school, currently Cadbury House, and later Lewisham School in Weston, David immediately joined his father on the dairy farm. 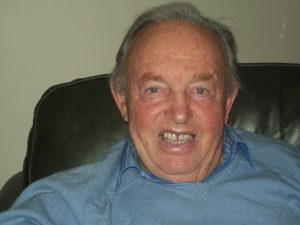 A gentle kind man, with farming as the mainstay of his life, he played cricket and skittles for village teams. He married Veronica and they made their home in a bungalow built on the farm, where he lived for the rest of his life. The family grew with the birth of Mark, followed by Joanne and then Stephen. David’s younger brother Geoffrey joined the family on the farm and over the years this expanded to over 500 acres. After Geoffrey died in 2006, the farm was divided between David and Geoffrey’s widow Delia. The farm is now the only surviving dairy herd in Congresbury, which originally had over 20. The funeral service was conducted by the vicar of Congresbury, Rev. Matthew Thomson, and the eulogy was read by Mark Edwards. David leaves a widow, three children and six grandchildren.